Nationwide acceptance for gasoline purchases at over 14,000 participating Exxon or Mobil locations. CarCareONE charges you no interest on any purchase over $150 if it”s paid in full within 90 days. A minimum monthly payment is required. Take it with you when you travel. It”s accepted nationwide. No need to worry about car repairs while you are on vacation. 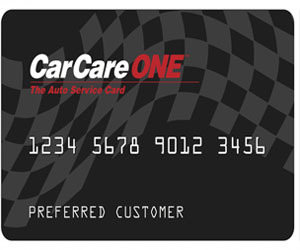 You can use the CarCareONE card at participating dealers throughout the United States. Doesn’t tie up your other credit cards with car related expenses. Using the CarCareONE card for all your vehicle”s service needs lets you preserve your major credit cards for other uses. Plus, it”s the convenient way to keep track of all your auto related expenses.